Competitors take positions in their allotted lanes. At the starting signal, competitors race the 90 m course to the finish line. The finish is judged on the chest crossing the finish line. Competitors must finish the event on their feet in an upright position. Teams of four runners (three in Masters) compete in baton relay fashion over a 90 m course. To start, competitors take positions in their allotted lane at each end of the course. After the start each competitor completes a leg of the course with a baton and passes the baton to the next runner. All competitors must finish their leg of the event on their feet and in an upright position. 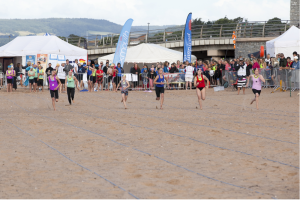 From a prone starting position, competitors rise, turn and race to grab a baton (beach flag) buried upright in the sand approximately 20m away. Since there are fewer batons than competitors, those who fail to grab a baton are eliminated. Competitors take their allotted positions, a minimum of 1.5 m apart at the start line, face down with their toes on the start line with heels together, hands on top of each other with fingertips to wrists and head up. Elbows should be 90 degrees to the body’s midline and hips and stomach must be in contact with the sand. The body’s midline should be 90 degrees to the start line. Competitors may level, flatten, and compress their starting area but no scooping of the sand or digging, or digging in of the feet is permitted. Why all these detailed regulations? This is a highly competitive, tactical and very physical event where every advantage possible is taken and the outcome is based on split seconds where tiny details can make the win or loose difference. The Beach Run is a distance event run over 500m – 2000m depending on the age of the competitor.